The best treatment results for Charcot foot and ankle are when the disease is treated during its initial stages. The historical treatment strategy has been to stabilize the condition by placing the foot in a total cast and immobilizing it. The patient is not to weight bear on the affected foot, which can be difficult for many patients, particularly those with obesity, diminished proprioception, and muscle weakness. The goals of treatment are to remove the ulcers and infection, realign the dislocated joint, and reconstruct and stabilize the bony deformities. Conservative treatment for Charcot neuroarthropathy includes wound care, foot casts, custom-molded shoes, and specialized braces. These strategies are used to protect the tissue of the foot in order to prevent or delay the development of ulcers. These treatments also seek to support the foot and ankle. Conservative treatments may prevent or delay surgical intervention; however, surgery is indicated when the support is unable to stabilize the foot and ankle or there are recurrent ulcers. Even after surgery, these conservative treatment methods are carried out. The goals of surgery are to restore alignment and stability to the foot and ankle. Surgical reconstruction is typically performed during stages 2 and 3 of the disease. Patients usually seek treatment during the later stages of the disease, when they notice ulers and changes to the shape of their foot. It is unusual for patients to seek treatment in the acute stages (stages 0 and 1). A new method is to apply an external fixator in lieu of a cast. The improved technology in external fixation with the Taylor spatial frame (TSF) has allowed for greater application in deformity correction of the foot and ankle. External fixation allows for early weight bearing, increased range of motion, decreased osteoporosis, and easier access to soft tissues for wound care. We use a two-stage correction involving external and internal fixation. First, the deformity is corrected and realigned gradually using an external fixator (the TSF). This restores the proper anatomical position and allows the soft tissues to heal. Second, we maintain the corrected alignment by removing the fixator and applying internal fixation; we prefer to use intramedullary metatarsal screws that span from the toes to the ankle joint. We have received excellent results with this two-stage technique. 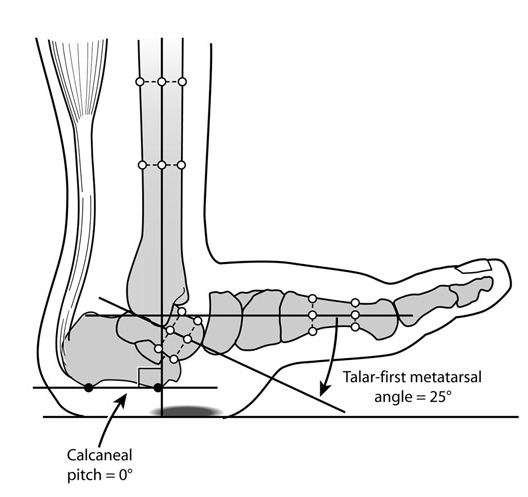 Example of Charcot foot with equinus deformity (calcaneal pitch of 0 degrees) and rocker-bottom foot (talar-first metatarsal angle of 25 degrees). The first step of surgery is to correct the equinus deformity that is almost always present with Charcot disease. 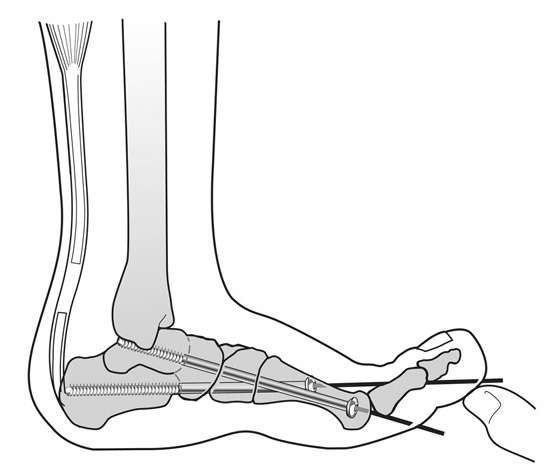 Patients with equinus deformity have difficulty pulling their foot upwards, resulting in limited ankle range-of-motion. 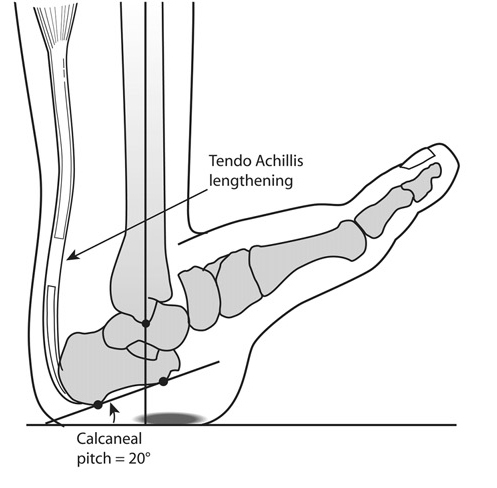 In order to correct this, a lengthening of the Achilles tendon is performed. Whenever possible, we will perform a gastrocnemius-soleus recession instead, to minimize the loss of Achilles tendon strength. The next step is to apply the external fixator (TSF) for gradual correction and perform an osteotomy (surgical bone cut) of the midfoot if necessary. 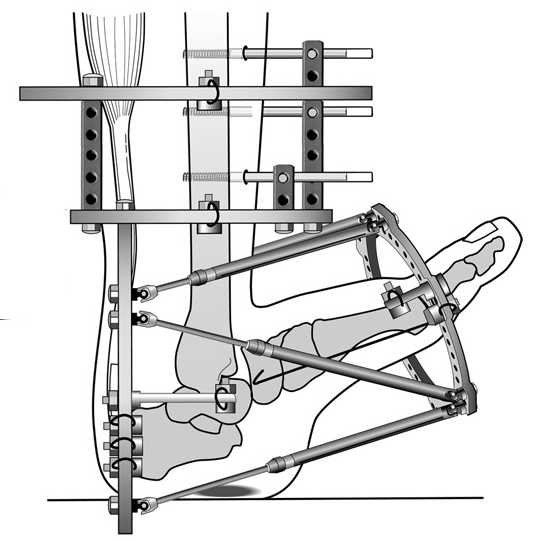 The hindfoot and ankle are fixed in the corrected position by the TSF following the Achilles lengthening. The frame is extended across the foot and a second ring fixes the forefoot. Application of the Taylor spatial frame. Note the initial position of the forefoot. Gradual distraction (5 – 15 mm) is performed in order to realign the forefoot to the hindfoot. Correction is obtained after one to two months of distraction. Before the external fixator is removed, small incisions (2 – 3 cm) are made at the joints to prepare them for the arthrodesis. An arthrodesis is a surgical method to induce ossification (formation of new bone) in the joint. Anatomy of the foot after gradual correction. Note the final position of the forefoot relative to the midfoot. After the gradual distraction has completed, stage two is performed. The second stage consists of two parts: arthrodesis of the affected Charcot joints and the application of internal fixation. 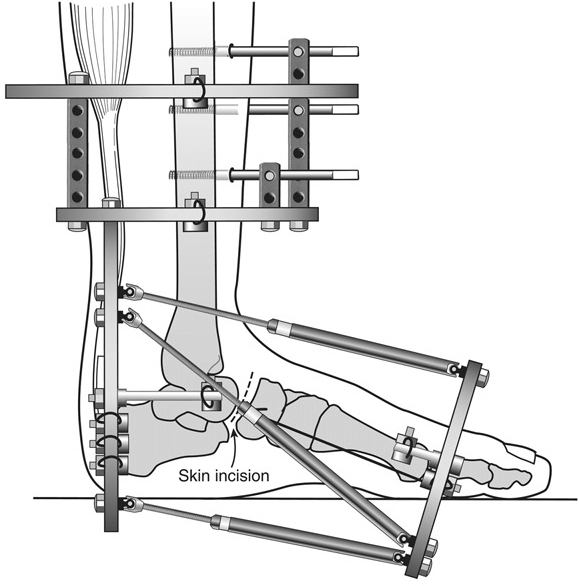 After the arthrodesis, guide wires are inserted into the foot and the external fixator is removed. Partially threaded intramedullary metatarsal cannulated screws are inserted at the guide wires to compress the medial and lateral columns of the foot. Before the patient is discharged from the hospital, the patient’s operative splint and dressing are removed, and they are placed in a short-leg cast. The short-leg cast is non-weight bearing and must be worn for 2 to 3 months. After that, weight bearing is increased gradually. The entire treatment is completed in 4 to 5 months. Patients with neuropathic conditions require close clinical follow up. Appointments should be scheduled with the surgeon and the physician assistants every two weeks to assess the external fixator and possible pin site infections. Wound care is also a very important aspect of treatment for Charcot neuroarthropathy. Wound care appointments should be scheduled regularly to ensure that the ulcers and myelitis are properly managed.